The dolly zoom is one of the most discussed cinematic techniques. You can use them in many ways, but a great director will find a logical reason and pair them with the correct moments to excite viewers. In today’s post, we’re going to break down the dolly zoom (vertigo shot) so that you not only understand how to create one but also how to go about identifying the right moment and methods to do it correctly. So what exactly is a dolly zoom? What is a dolly zoom? A dolly zoom (known as zolly or vertigo effect) is an in-camera effect where you dolly towards or away from a subject while zooming. This creates a sense of unease in the viewer, simulates a spatial warp, and can either shrink or extend distances based on the choice of direction. This is commonly referred to as the vertigo shot, or vertigo effect which was made popular by Alfred Hitchcock's film Vertigo. What to consider when you use a dolly zoom? So just remember, you can dolly in and zoom out, or dolly out and zoom in. Each will create a different effect and feeling, so consider which makes the most sense for you story and scene to get the most out of the vertigo effect. This dolly zoom is a perfect example of how a specific film technique could be used as a representation of supernatural forces in your story, and also serves as a visual motif, like it did for The Fellowship of the Ring. To give you a concrete dolly zoom example, we're going to break down the surrounding shots in a scene from the film, and provide some context for why Jackson used the dolly zoom in this scene. In this scene, the Hobbits crash land after a big tumble down a hill. We land with a close-up on Pippen, then steadicam forward to a medium-closeup (MCU) of Mary along with Sam’s fuzzy foot in frame. The manure, the broken carrot, the dialogue - all tell us that this scene is funny and light hearted. The viewer can relax… right? 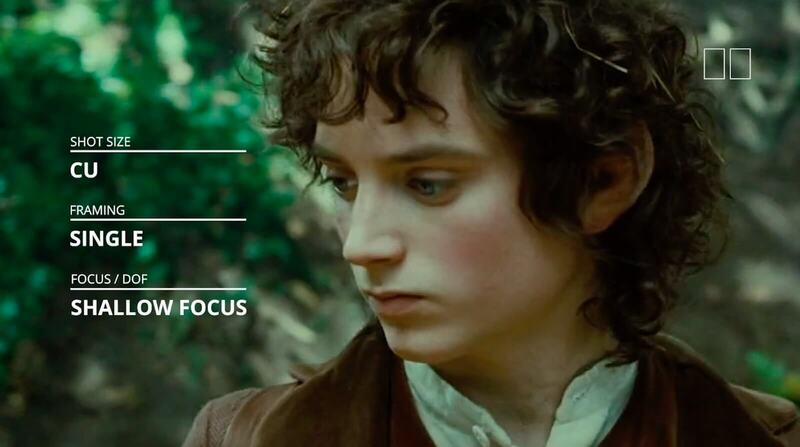 Peter Jackson decides to frame Frodo in a close-up single & uses a shallow focus. The movement here is rounded, rather than perfectly lateral. This helps to enclose him. Lateral movement wouldn’t get the same result. 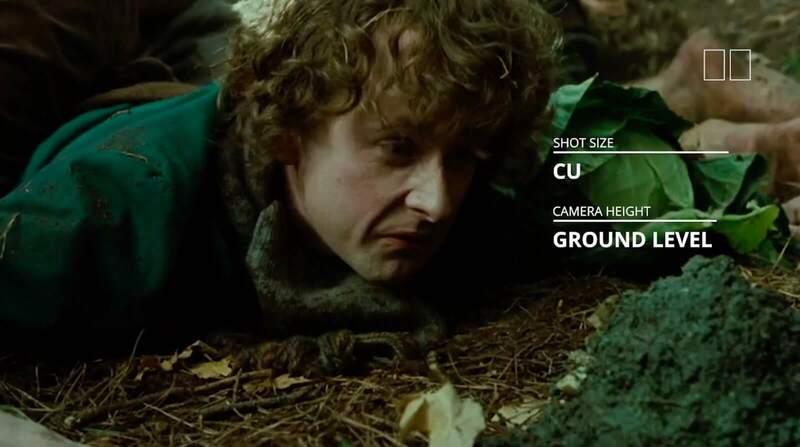 Frodo has a separate feeling from his friends, so Jackson isolates him in the frame and adds a shallow focus to generate a sense of claustrophobia. 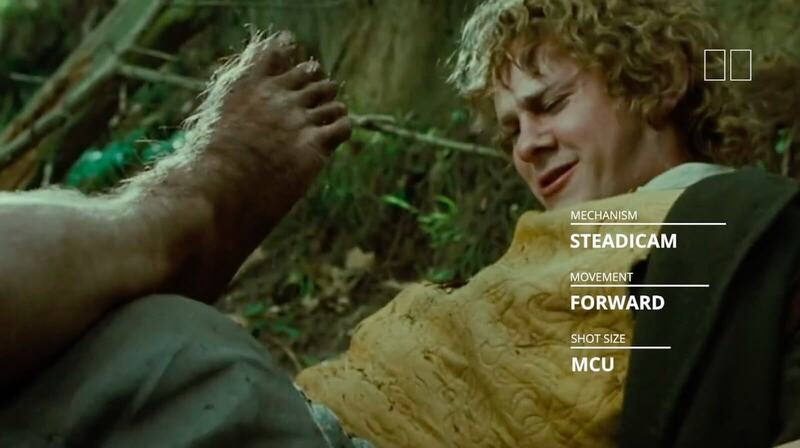 Then he uses motivated camera movement to push our eyes further down the road toward Frodo, who searches around for danger. We’re right there with him. We feel the danger…. and the suspense builds. We see a level change from ground level all the way up to a slight high angle which makes our little hobbit appear even smaller, more vulnerable. A high angle shot has the benefit of shrinking even the tallest actors down to halfling size. At this point in the film, Frodo’s Hobbit friends are unaware of the danger ahead. Even Frodo has his doubts. This is where we see our long awaited vertigo shot. Motion bears down on Frodo. Shrinks the distance of the road. Danger is moving toward the Hobbits, and it doesn’t have far to go. This is the first time we get to see Frodo register the seriousness of his situation, and Jackson does this through the use of a dolly zoom. He uses it to represent the supernatural forces throughout the franchise, again... and again. When directors use the vertigo shot, they will often leave an actor in frame so that the perspective distortion can represent the emotions within the subject, but Jackson leaves his actor out of frame and instead uses the dolly zoom to establish a visual motif. Pretty neat, right? This entire analysis was done to show you how the dolly zoom can be used with precision to give viewers a reaction. Below, we’ve provided you with a storyboard with this entire scene broken down, with the detailed shot specifications. We now know exactly when dark forces are most near - and we are speaking the same language as the director. Where in my story would a dolly zoom be most effective? There is something else that makes this scene work so well, besides just the vertigo shot. It’s called a tonal shift. That’s when the film tone of a scene changes drastically. Arbitrary shifts in tone are often unwelcome, and indicate that the director lacks a clear vision, or is cavalier with their storytelling. What is it about this particular shift in tone that works so well, while others fall flat on their face. The main reason, and this is almost universally true with anything in filmmaking, is that it enhances the chain of events within the scene. Because good stories are all about peaks… and valleys. But then the answer presents itself. Jackson builds a scene with fluffy, low stakes imagery that leads to us to a moment of dread. So Jackson gives us one of the most terrifying scenes in the film. Peter Jackson may have been excited to use the dolly zoom in his film, but he took the time to consider how and when he should use them, and in turn, he stumbled onto a great cinematic motif for his films. It isn’t enough just to do the vertigo shot well from a technical standpoint. You need to be able to justify it from a narrative standpoint as well. It’s worth mentioning that while the dolly zoom did much of the heavy lifting - it didn’t go into battle alone. The filmmakers combine this technique with wind, and tree leaves. Think of the production value the dolly zoom shot gained from a simple leaf blower tossing leaves up in the air. 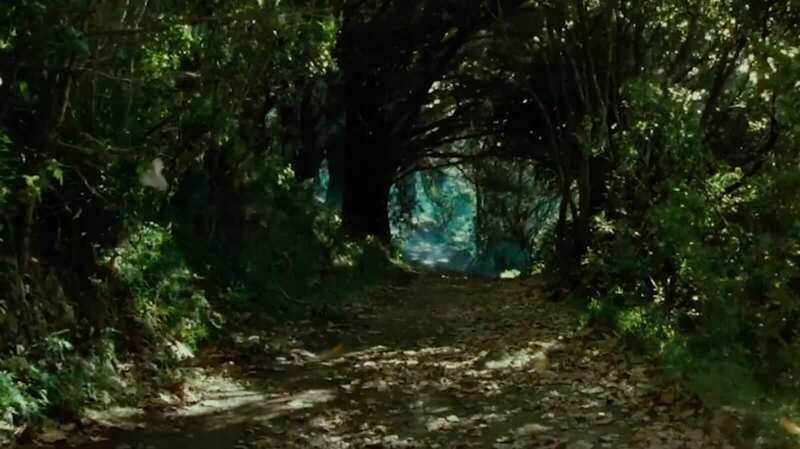 The reverse shot has a big push forward on Frodo, and the crew shoots up more leaves, which continues the supernatural imagery and motivates the change to eye level. There are any number of ways to shoot this particular scene, or more broadly, to introduce danger upon your hero. But with a dolly zoom, you gain an overwhelming effect that is quite unforgettable and makes the scene and imagery associated with it unforgettable as well. This is why the vertigo shot is one of the riskiest shots in cinema. High risk = High reward. Most viewers have seen a dolly zoom shot used correctly. But you will never outrun a poorly motivated dolly zoom. Don’t forget to make sure your dolly speed and zoom speed are the same so that they can each land at the same time. Now you know what the vertigo shot is and when to use it for impact. To help you even further, we've put together a list of every film that used the dolly zoom in film and television. Now that you understand zolly, it’s time for you to learn about other camera movements you can use to tell better stories. In episode 4 of our filmmaking techniques masterclass, we break down 9 camera movements to improve your visual storytelling.